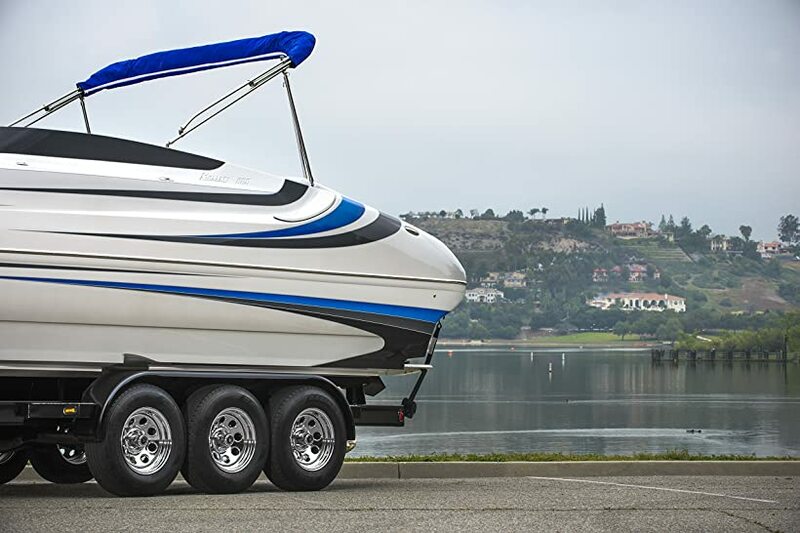 Best Boat Trailer Tires Reviews For The Money 2019 (NEW GUIDE Top 5)! Looking for the best boat trailer tires? Looking no further! We’ve already did the hard work for you in order for you not to waste your time and money with no good boat trailer tires. We decided to put together a list of the top 5 best boat trailer tires for the price! Carlisle has one of the best trailer tires out there. They come in a range of sizes for all types of applications but all with the same quality. We will get started with saying that these tires have a maximum capacity of 2,150 lb, making them ultra-durable. This maximum weight, of course, is achieved at a pressure of 65 psi, meaning that this tire is load range D. Carlisle is a preferred brand by those who know. The company offers their radial trailer HD trailer tires for both short and long distances. There is a larger amount of tread wear on the Carlisle and is also great at resisting heat. This ensures that you will not be suffering any regrettable accident on the road. All of these traits add up to provide us with a very durable tire, with the guarantee that you will not have to replace them in a while. This one was developed to reduce rolling resistance, which increases durability and increases durability. The most popular version, the 205/75R15 has a weight of 20 lb. All the other models do not really differ from this weight but they stay within a close range. All of the models are great for very heavy loads, which makes Carlisle a benchmark when it comes to heavy-duty tires. The Trailer King ST Radial is an 8-ply trailer tire. One of its most outstanding features is a center groove that provides stability and consistent tracking. A great quality tire with traits that will make you turn to this one for your boat trailer needs. Equipped with a special shoulder design, the Trailer King is optimized to dissipate heat effectively. This results in an even wear and a longer tread life. For superior strength and stability, the tire has a nylon overlay construction. This 205/75R15 boat trailer tire has a weight rating of 1,820 lbs (load range C) at a maximum pressure of 50 psi. This, combined with its thick ply makes this tire a premium and a highly durable one. In general, this tire provides the best weight and speed ratings. This gives you an important piece of confidence that it will perform at its best, especially during very long journeys. We are talking about a tire that performs excellent on the road and will give your boat trailer the stability it needs. Expect these tires to last for a very long time. Trailer King’s 5-year warranty keeps you protected and confident that you have a tire for a long time. Freestar’s boat trailer tire is an 8-ply super durable tire, designed to last and to withstand heavy loads even during long trips. This tire is load range D and will deliver great performance, no matter what the conditions of the road are. The tire has a maximum tire rating of 1,820 lb at a max pressure of 65 psi thanks to the 8 layers of rubber it is built with. This is a heavy-duty tire for providing stability to your boat trailer. It performs equally ideal, during short and long trips and when the road is bumpy or rocky. Chief in reliability, the Freestar M-108 8 Ply D Load Radial Trailer Tire is a great option for your boat towing needs. The dimensions of this particular tire are 205/75R15. It is compatible with most trailers, but, as the manufacturer enforces, it should not be used for vehicles. For the price, this tire is really a great option, a great value for the money. It is tough, flexible, durable, and reliable. You can trust that this tire will not blow up while you are on the road. Freestar’s warranty protects against any issue and also gives you the peace of mind that you will not be left on the road. Freestar keeps impressing with its durable tires at a great price. This version of the M-108 shares most of the characteristics of the one we reviewed above, except that this one, as indicated in the name is a 10-ply. Users of the 10-ply version of the Freestar M-108 have very good comments about it. Because of its highly durable rubber plies, this tire has a load rating of E. The tire has an impressive tire weight rating of 2830 lb at 80 psi, making it the strongest in our list. When it comes to heavy duty and performing during long trips, this is the tire you will hear about. The best part is that it comes at a really affordable price. The M-108 10-ply is built for those boat trailers that weigh more than the usual ones. Most small to medium-sized boats are usually within the range of what load range D tires can carry. But this tire can carry a bigger boat, which is why we recommend it for clients with heavier gear. This is another great product for heavy-duty activities and at a great price. Designed to deliver in rough terrains, the White Spoke Trailer Wheel is one of the best products you will find out there. It is definitively a heavy duty which will satisfactorily respond to highly demanding roads. The tire has a weight rating of 1,820 lb and is within load range C. The size of it is ST205/75R15. It is made with durable and the purchase includes the rim. It is imperative that you keep your tires clean in order for them to perform to their fullest all the time. These tires, given their durability, will last for many years. They are designed to withstand heavy boats and carry them with ease. Long or short trips are no problem for the White Spoke Trailer Wheel. It delivers with absolutely no issue for distances well beyond 1000 miles. You want to use these tires to carry around your small- or your medium-sized boat. Boat trailer tires usually do not get the premium treatment that car tires get, for example. Since boat trailers do not really have much of a use, we tend to dismiss taking care of them. You should always aim toward durable tires and those that will meet your needs. In order for a tire to last longer, you should always inflate it at the suggested pressure, which is usually indicated in psi (pounds per square inch). This information is printed on the side of the tire. When you inflate your tire make sure you do it cold as the pressure will increase during rolling and due to the heat of the pavement. Inflating the tire to less than the suggested pressure will reduce its life as well. Also, this is a call for disaster as it may actually blow out when you least expect it. You will also notice within the information on the tire’s side, there is a load range, which goes from A to E, A being the lightest and E being the greatest. Mostly, the best trailer tires for the money are load ranges between B and C.
Sometimes, exceeding this load range when buying trailer tires becomes pointless, unless you are carrying a very heavy boat or using them for long distance, which is why we did another review on the best rated travel trailers tires. The maximum weight rating refers to the maximum weight that one tire can hold. If your trailer has two tires, then consider that the weight of the boat and trailer is distributed within the two tires. If your boat exceeds this weight rating, you are calling for disaster. You should always make sure that the size of your tire is what you need. It is indispensable that the size of the rim is exactly the one specified on your trailer. When it comes to weight, usually the lighter the better. This is because one of the things that you should know about the axles on your trailer is how much they can support. The trailer thread is an important factor to consider when you are searching for durability. There are usually two main types: the bias ply and the radial. The former have very strong sidewalls while the latter are pretty long-lasting as well. When the tires are in use, the sides of it are just as important. If a tire is not well taken care of, it might cause an explosion. Many clients complain of bumps on their side. In the case of ply tire, there is usually a 2-ply for the sides. Verify that your new tires have the needed sidewall strength. This information can be found on the sidewall as well. This is also fundamental to bring into consideration when choosing the perfect tires for your vehicle. Typically, the speed rating of boat trailers is 104 mph or 65 mph. Some factors that determine speed rate are tire inflation and load specification. You know what they say, cheaper is always more expensive. A durable tire will not come cheap because manufacturers have focused on giving it utmost durability. To get information about a tire’s durability, check out online stores and customer comments. Some studies have suggested that people will rely more on user-generated content than what the advertiser tells them. Getting the best set of tires for your boat trailer, as you have seen, is more than meets the eye. The most important thing is to make an educated decision. Depending on your budget, always go for the highest quality as this will give you the peace of mind of a safe travel. Keep in mind the important qualities described above before making your purchase.